Panelist for Fielding Alumni Focus Webinar – Kathy J. Marshack, Ph.D. Many of you may know that I earned my Ph.D. at Fielding Graduate University. I’m pleased and honored to be invited to be one of four panelists to speak at the first ever Fielding Alumni Focus Webinar. It feels good to be doing something for my Alma Mater again. I spent happy years learning at Fielding and now I have the privilege to share my expertise as a published author with the alumni and student community. 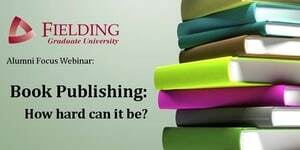 The topic of this Webinar is: Book Publishing, How Hard Can It Be? to be moderated by Dr. Carol-Anne Minski. Three other panelists – Elena Gillespie, Carol Minski, Jesse Sostrin – and I will discuss the ins and outs of getting your book published. It will be held on Tuesday, September 15th at 3:00 pm (PT). My specific assignment is to talk about what it’s like to work with publishers – how I approached them and what the process consists of. I’ll also share how I work with retailers and collaborate with others to get my books published. Based on my and experience coaching entrepreneurial couples, I’ve come up with a “Checklist for Success.” Learn if you and your spouse have what it takes by working through this interactive workbook. Click here to learn more. Learn the traps entrepreneurial couples can fall into and find practical advice for dealing with them as you discover how a couple balances intimacy with family life and meaningful work. Click here to learn more. You may have heard about Asperger’s Syndrome in children, but what happens when autistics grow up and marry? Unlike Rain Man, who had a more severe form of autism, a smart, financially successful AS husband or wife can pass for normal, except at home. Click here to learn more. Take an honest look at the unique issues that come up when you’re co-parenting with an Asperger partner. So many of the interactions within the family circle require empathy, which are literally out of mind – out of sight for the Aspie (ASD) parent. This is essential reading for the Neuro-Typical (NT) parent to learn more about Asperger Syndrome and find a way to co-parent, co-exist and even thrive within the Asperger/NT family unit. Click here to learn more. Next PostNext Can ADD Be Healed?